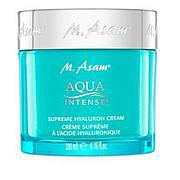 The Aqua Intense line is based on our proprietary complex of three different kinds of hyaluronic acid. It helps hydrate skin and promote the retention of moisture. Apply and gently massage onto the cleansed face and neck in the morning and evening. 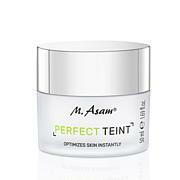 Dermatologically tested and demonstrated to be suitable for sensitive skin. 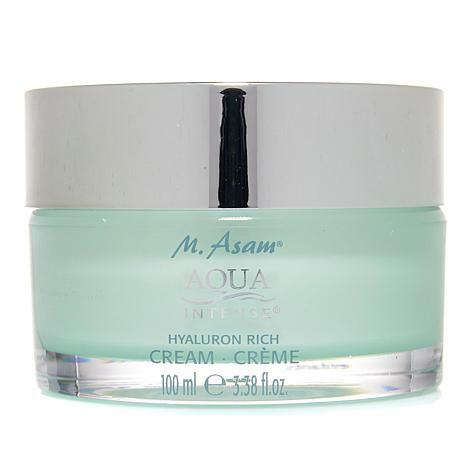 M. Asam Aqua Intense Hyaluron Rich Cream 3.38 fl. oz. Ingredients: Aqua (Water), Methylpropanediol, Simmondsia Chinensis (Jojoba) Seed Oil, Butyrospermum Parkii (Shea) Butter, Cetearyl Ethylhexanoate, Dicaprylyl Ether, Polyglyceryl-3 Methylglucose Distearate, Glycerin, Vitis Vinifera (Grape) Seed Oil, Hydrogenated Vegetable Oil, Macadamia Ternifolia Seed Oil, Prunus Amygdalus Dulcis (Sweet Almond) Oil, Behenyl Alcohol, Cetearyl Alcohol, Pentaerythrityl Distearate, Tocopheryl Acetate, Oenothera Biennis (Evening Primrose) Oil, Sodium Hyaluronate, Hyaluronic Acid, Silanetriol, Panthenol, Saccharide Isomerate, Tocopherol, Escin, Dipentaerythrityl Pentaisononanoate, Glyceryl Undecylenate, Ammonium Acryloyldimethyltaurate/VP Copolymer, Lecithin, Sodium Dehydroacetate, Alcohol, Acrylates/C10-30 Alkyl Acrylate Crosspolymer, Disodium EDTA, Sodium Stearoyl Glutamate, Ethylhexylglycerin, Butylene Glycol, Sodium Hydroxide, T-Butyl Alcohol, Potassium Phosphate, Citric Acid, Sodium Citrate, Sorbic Acid, Dimethicone, Phenoxyethanol.